Georgia has more to prove in 2019 than perhaps any other team in the country after it upset its way into nationals last year and then brought in a potentially game-changing freshman class. The talented youngsters have a few injury question marks (in particular, expect Megan Roberts to miss the first few meets of the year) but as a whole the Bulldogs have looked prepared in preseason footage and seem focused on fighting their way back to the top. In non-routine questions, we’ve heard that head coach Courtney Kupets Carter has been attending practice regularly despite recently giving birth to her third child, but I’m curious whether volunteer assistant Suzanne Yoculan Leebern will be taking over some head coach responsibilities during the early weeks of the season to lessen the strain on Kupets. It would just be great to see that. There are also a few questions about Ohio State’s lineups at this point—we haven’t seen freshman Miriam Perez or sophomore Danica Abanto in training lately—and on the whole it would likely take errors from the Gymdogs for an upset to take place today. (Unless the whole thing erupts into chaos, which is COMPLETELY possible. Neither of these teams exude reliability just yet.) That said, the Buckeyes are a team on the rise after an extremely successful first season with head coach Meredith Paulicivic—whose serious choreography chops are also shaping them into an aesthetic powerhouse. Even if they don’t put up big numbers today, expect them to show some seriously gorgeous gymnastics that could contend in a few weeks’ time. The stream opens on a shot of Meredith Paulicivic holding a bright red soccer ball. I’m not sure why. OAKLEY – UGA: Acceptable full, not the most amplitude, with a little side step. HUANG – OSU: Blind change to Jaeger is great, bail the slightest bit short, full in stuck dead. Very strong start! VEGA – UGA: Much more distance, crunchy on the table but really beautiful in the air. HINTERBERGER – OSU: Blind to Jaeger, really tidy catch, great bail. Might have been a touch shy on her cast on the high bar, blind full double back really nice and stuck. DICKSON – UGA: Omelianchik is gorgeous, ultra clean block and great distance. Big hop forward, which is expected at this point in the season I think. MILLER – OSU: Freshman debut. Maloney is gorgeous, no leg separation on the back swing, to bail. Shy on the cast handstand on high bar, same as Hinterberger, blind full to double back that was right on top of the bar but stuck. She’s really beautiful, this will be a very useful routine. WARD – UGA: Tsuk full, body position for DAYS. Hop straight back but it’s perfectly in line. The Gymdogs will get mileage out of that thing. STONE – OSU: Blind to Jaeger to overshoot, gorgeous. Blind full, almost loses her legs but pulls it out, into double back with a step side. 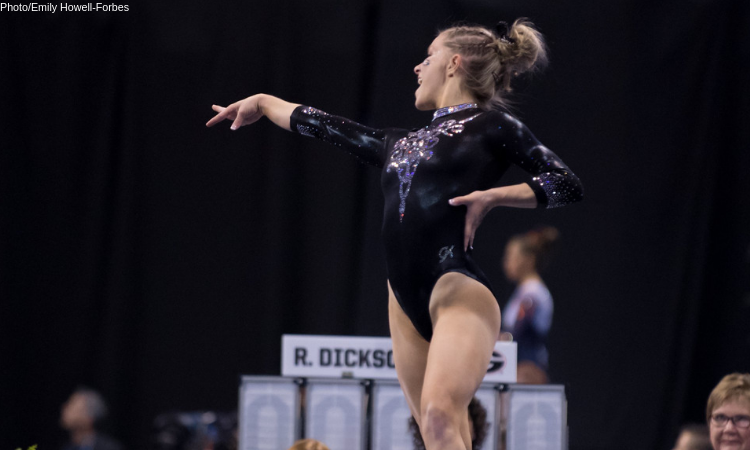 SNEAD – UGA: Yurchenko one and a half with a little hop forward. That vault is so effortless, it doesn’t feel like she has to block that hard but she flies. AEPLI – OSU: This routine can be so gorgeous. Toe on to Maloney, peels. I don’t think she ever really got her hands on the bar there. She did the same thing at the season opener last year, must just be a bit of nerves. Repeats it and it’s beautiful, into bail, full out dismount and tries to hang onto the stick. Next time. 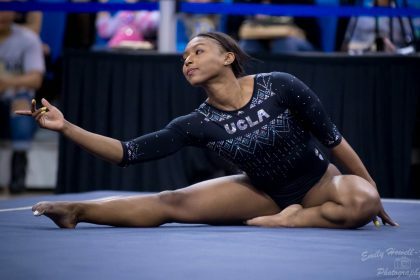 LUKACS – UGA: Yurchenko double full, aggressively twisting onto the table and lands with her legs slightly staggered, but it’s just monstrous in the air. Great freshman debut! SCHWARTZENTRUBER – OSU: Maloney to Pak, catch feels a little wonky but she works it out, great van Leeuwen, shuffle back on double layout dismount. Baumann in exhibition for Georgia. Super excited she’s healthy – there was an ankle situation in presason. Yurchenko full is good with a step back! Ooooooh Ohio State is putting Gagliardi up YES. She does a Ezhova and it’s absolutely textbook, I love it. Forgot how to bars for a hot second, went sideways on the high bar and had to jump off, but she’s got the meat of that routine down. Scores seem really low for what I saw from the the Buckeyes. It was hard to see every handstand from our camera angle, so those could have been worse than I thought. Great start to a whole bunch of freshmen’s careers there! SCHWARTZENTRUBER – OSU: Yurchenko full, not the world’s most amplitude but pretty in the air with a clean landing, just a little toe shift. SNEAD – GEORGIA: Clear hip to Tkachev, felt like she released a little late to me. Good bail, has to pike double layout down with a little hop. Such a special routine for a lead off. Power move. MCLELLAND – OSU: Yurchenko arabian, really solid in the air, step forward. Ohio State has a good handful of those. LUKACS – UGA: Tkachev is very low, just barely clears the bar. Clear hip to Pak, hits the bar quite hard, some handstands are short, double layout is whippy and close to the bar. Not bad for a freshman debut on bars, but I’d expect the Bulldogs to trial some different routines in that spot. JENNINGS – OSU: Yurchenko full, way back on the table but just beautiful body position with a big hop back. Another freshman debut! 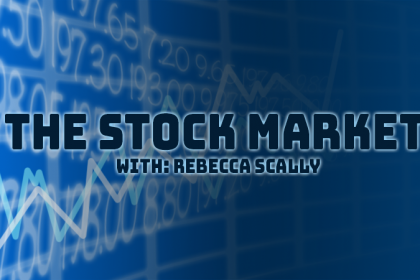 AL HAMEED – UGA: Really excited for this one. Full turn to Tkachev and she FLIES. Great handstands, good bail, wobbles a bit on her squat on, pings off the bar on her full out dismount but body position stays clean. Wow! LOWE – OSU: Yurchenko full, another really big hop back but clean with okay amplitude. SCHILD – UGA: Ray is great, really nice Pak. Toe on to toe shoot, nailing the handstands, double layout hollow with chest a bit down on landing but her technique is so gorgeous. AEPLI – OSU: Beautiful Yurchenko full, maybe just a touch piked toward the end with a little hop in place. DICKSON – UGA: Great Ray, bail to toe shoot gorgeous. FTDLO dismount with a tiny hop in place! Nails the upgrade there. Ultra impressive. STONE – OSU: Yurchenko arabian is gorgeous, little hop forward. It’s almost flared. OSU has some really strong technical vaulters, just need a little more on the landings as they go through the season. OAKLEY – UGA: A little late on her Higgins, pike Jaeger is gorgeous, ooh YIKES she’s okay. Pulled her full in dismount right on top of the bar but she landed on her feet and didn’t hit any body parts so it’s all good. Ohio State still ever so slightly lowballed, to my eye, though they will want to clean up their landings as season goes on. Al Hameed will be a rockstar for Georgia, don’t be fooled by her score today which was mostly a fluke. SNEAD – UGA: Really strong bhs loso bhs series, great punch front, I missed her dance series whoops. Double twist with a hop back. Really secure first routine. HUANG – OSU: Double pike, not the highest but securely around. Two and a half twist, arabesque out. Switch half to Popa, she’s really fun to watch on this event even though she’s not a life changing dancer. 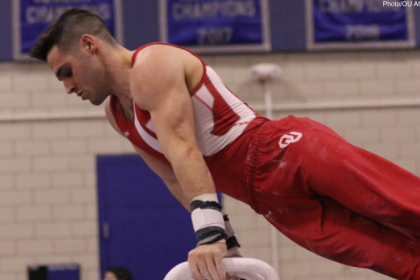 Coach Paulicivic is really good picking routines that work for each gymnast. One and half punch layout, great! DICKSON – UGA: Front aerial to split, gorgeous. Flic loso with a big wobble… leans to the side and touches the beam, ugh. Switch switch, tentative on landings now, bhs to one and a half twist. There’s our drop score. ABANTO – OSU: Really excited for this! The sophomore was injured and couldn’t compete last year, I believe this is her collegiate debut. Double pike, scoots back a little, one and a half front lay, leap series is gorgeous. This choreo is silly and she’s absolutely milking it. Double back, high in the air… can’t kick out of it and falls. That’s probably a stamina thing, hopefully she can get it to work in the future. SCHILD – UGA: Absolutely love her split handstand mount. Flic loso gorgeous, split to sheep, couldn’t see how good it was fron the front angle. Side scale series, love it, full turn. Side aerial back full with a little hop back. She’s so beautiful on this event. LOL DICKSON GOT A 9.65. That’s literally impossible. GAGLIARDI – OSU: Late sub for Schwartzentruber here. Lineup debut for the freshman. Front lay to Rudi with a step forward, good leap series. Oh, this one has performance quality. 100% conviction on her choreo and her faces are gold. Double back and milks the landing. I’m deeply in love. BAUMANN – UGA: Side aerial LOSO, bit of a check, 1 1/4 turn… I always wonder why more people don’t do those, it’s much easier to land. Pretty leaps, I think that was a double twist dismount. That’ll get better. AEPLI – OSU: Ultra dramatic violin music, double back to open. Tour jete 1/2 to Popa. Front full front lay is gorgeous, turning leap <3 I’d like to see her wind up the drama for this routine. OAKLEY – UGA: Triple series, a little off line on the last salto but uses her arms to arrest it. 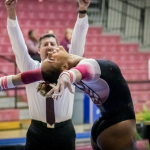 Have to think that the pressure of the beam lineup last year was galvanizing for her and Schild as freshmen. Leap series was I wanna say switch to ring jump? Gainer full dismount flies. Not many of those are actively great but Oakley’s is. MCLELLAND – OSU: Double pike, hop to lunge. One and a half to front lay, dances out, switch side to Popa. I want to see how this lineup looks at home, a lot of these routines seem like they’re designed to generate crowd engagement and it’s just not happening today. Double back to close, really secure! VEGA – UGA: Pretty pretty leap series, front aerial to split, gets a roar from the crowd on the moonwalk. Flic layout, juust a touch of knees, great full turn, side aerial back full and just pulls her heels together. STONE – OSU: Always one of the strongest performers of the team. Double pike, overpowers it ever so slightly and pulls her front foot up but stays in bounds. Some twist with crossed legs,for her second pass, two and a half twist with a bit of a cross stumble. Magee in exhibition for the Gymdogs. Straddle to straddle half, flic loso gorgeous, switch switch side, side aerial back full with a hop back. Get her in there guys. Gorgeous. Both teams really solid. I honestly expected chaos in this meet, but everyone’s putting together some very good scores. SCHWARTZENTRUBER – OSU: I think one and a half? wolf turn to start, bhs loso very pretty. Cat leap to kickover front, goes way over forward, grabs the beam and falls. Switch split is great, gainer full with a hop. Whoopsie. PEREZ-LUGONES – UGA: Double pike, runs back out of bounds. One and a half front lay. The freshman nerves are real, but she’s such a natural performer on this event. Double back to close, undercooked, stumbles forward and puts her hands down. Bummer for her first routine. She’s immediately pulled aside by Yoculan. HUANG – OSU: Full turn is gorgeous, flic loso, never gets her second foot down and wobbles a bit but gets it under control. Switch to Korbut is beautiful, split to beautiful sheep with another little check. Double full, hop in place. Decent recovery. MAGEE – UGA: Another freshman debut and this will tell us a lot about her following the fall from APL. Pike full in, hop to lunge. I wondered if she’d underrotate it but it was fine. Switch side Popa is gorgeous, I’d love to see stills of those leaps, one and a half front lay to stags. She is incredibly precise and so far handling the pressure incredibly well. Little bounce back out of her double feet but keeps it on her feet. For me, she’s just earned a lineup spot for the rest of the year. We’ll see whether the coaches agree with me but that is NOT an easy position to be in on your freshman debut and she pulled it off. LOWE – OSU: Gorgeous mount, swinging under the beam, flic loso is airy and wonderful. Lean back in a switch side series but gets it under control. This is really beautiful so far. One and a half dismount, stuck. Really really good! SNEAD – UGA: Oooh she was SO close to stepping out on her first pass, she lunged onto her toes on her back foot because her heel would have gone over her line. Great awareness to be able to avoid that. Rudi to Shushunova is gorgeous, double pike perfect. Got the momentum back now. STONE – OSU: Wrapping up a really solid all around set, she’s super steady. Two and a half twist?? with a hop forward to close. 39.0 for what I believe is her college all around debut! LUKACS – UGA: She’s using an old Fragapane routine. Double layout is great. Whip one and a half front lay. Dance isn’t special but great tumbling. Double pike. I’m struck by how much extra space she has on her tumbling passes, she gets them done really efficiently. GILSON – OSU: This is a new one for me. Flic loso with a lean, full turn is pretty. Cat leap switch half, really gorgeous, sheep jump is actually good! One and a half dismount with legs crossed. Total conviction in her first routine as a Buckeye good for her. DICKSON – UGA: Oh this is fun. Double arabian gorgeous, I feel like I should know this music. Either way, she’s performing the hell out of it. One and a half front lay, airy and gorgeous, switch side Popa. This is SO exciting. Double pike, fantastic! This is the Gymdogs’ best routine of the year for me. AEPLI – OSU: Staying on the beam hasn’t always been her specialty, but fingers crossed. Flic loso great, cat leap kickover front beat jump. Works through a bit of a correction there. Switch straddle great, gainer full stuck. Wow!! She competed beam three times last year and then was pulled, so it’s really exciting to see her not only back but anchoring and nailing it. VEGA – UGA: Closing routine. The knock choreography is still mildly ridiculous. Pike full in undercooked with a step forward. One and a half front lay to split, switch ring through tj1/2 leap series, and then a different leap that I didn’t catch, might have been a tj1/1. Double tuck gorgeous. Great routine. Really promising start from both teams. Georgia’s depth problems in 2018 are a distant memory now, and Rachel Dickson in particular looks ready to soar this year. I expect some lineup shuffling—I think if everyone is fully healthy Baumann and Magee will do more, for one—but considering what the Bulldogs have been working with in recent years, I can’t overstate the strength of today as a starting point. Ohio State had some shaky moments and some scoring that was on the pessimistic side, though not actively egregious, but today is a massive improvement over the disastrous road opener at UCLA last year. In particular, Stone and Aepli becoming all arounders can only be a win for the Buckeyes, and I was really impressed by the freshmen we saw today. I’m still waiting to find out what’s going on with Miriam Perez… but apart from that I’m really optimistic about Ohio State’s prospects this year.